The Himachal Cabinet today approved far-reaching changes in the state Panchayati Raj Act, including right to recall of non-performing ward members and deletion of the existing clause providing for disqualification of panchayat functionaries having more than two children. The hold of Mr Virbhadra Singh, Chief Minister, on the Himachal Pradesh Congress Committee was further tightened when the party high command appointed two of his staunch loyalists, Mr Harsh Wardhan, MLA, and Mr Kashmir Singh, former MLA, to the important post of general secretary. Seven persons were killed on the spot and four others were injured seriously when their Maxi van suddenly fell down some 200 metres from the National Highway No. 21 near Jhali Nullah into the Gambhar Khud chasm this morning. Taking serious view of the irregularities in grading of timber, the Himachal Pradesh Government today suspended six forest officers of the state forest corporation, including director of marketing, who were directly responsible for grading and sale of timber. With Gujarat Ambuja Cement Limited finally agreeing to hike the freight charges, the long drawn dispute for transportation appears to be resolved. The HPSEB Technical Employees Sangh has opposed the decision of the state government to trifurcate the board. Mr Kaul Singh, Irrigation and Health Minister, today termed the statement of Mr P.K. Dhumal, former Chief Minister, regarding the functioning of the state electricity board and its employees as mischievous and a futile attempt to mislead the people. A Rs 540 crore World Bank-aided social forestry project will be launched in Himachal Pradesh to spread green cover over midhill. This was stated by Mr Ram Lal Thakur, Forest Minister, while inaugurating a two-day workshop on the problem and prospective of afforestation and tree planting in degraded hills slopes here yesterday. With hundreds of vehicles halting daily at the multipurpose barrier here, traffic jams have become a regular feature here. With as many as six departments, including the local municipal committee, regional transport office and excise and taxation, having their own barriers, vehicles entering the state are required to stop here for clearance. An aged lady was crushed to death by a vehicle here early this morning. The body of the deceased was found lying near a petrol station on the Hamirpur-Dharamsala national highway when a person crossed that area. He informed the police. The Cabinet, which met under the chairmanship of Mr Virbhadra Singh, Chief Minister, cleared the draft bill to amend the Act. The bill seeks to make it mandatory for the village-level government functionaries of the various departments to attend gram sabha meetings, and failure to do so will attract action. Further up-pradhans will be elected by the gram panchayat members from amongst themselves and the existing provision of disqualifying the office-bearers of a panchayat for having more than two living children will be deleted as it has created social problems, besides being considered anti-woman. The gram panchayats will have only two standing committees — works committee and budget committee — instead of the existing seven committees, one of which will be headed by up-pradhan. Before suspension of any office-bearer of the panchayat, an opportunity of being heard will be provided. The legislators and MPs concerned will be permanent invitees and non-voting members of the panchayati samiti and zila parishad. It further provides that the gram sabha area can be reorganised and bifurcated only on the request of gram sabha members. In case of non-performance of the ward member, the voters of the ward concerned shall have the right to recall the member. The Cabinet decided to grant Class-I status to the district panchayat officers and Principals of the panchayati raj training institutions. The proposal to grant land for opening a kendriya vidyalaya at Rekong-Peo was also cleared. The Cabinet decided that the increased liability of Rs 5.6 crore on account of procurement of apple would be borne by the government. It also approved the draft bill to amend the Himachal Pradesh bus Stands Management and Development Authority Act to help increase the number of ex-officio/non-official members from nine to 12. The Cabinet decided to enact legislation to regulate and control the development of ground water and the matters connected therewith in Himachal Pradesh. The Cabinet approved proposals to fill 128 posts of regular patwari and providing training to 241 candidates, including 10 daily-waged patwaris working in the Public Works Department. It restored rent-free accommodation to patwaris in relaxation of provisions of abolition to rent-free accommodation issued by the government in department of general administration in 1999. The hold of Mr Virbhadra Singh, Chief Minister, on the Himachal Pradesh Congress Committee (HPCC) was further tightened when the party high command appointed two of his staunch loyalists, Mr Harsh Wardhan, MLA, and Mr Kashmir Singh, former MLA, to the important post of general secretary. Mr Raghu Raj, MLA and an ardent supporter of Mr Virbhadra Singh, has been made vice-president of the PCC. All of the three leaders were currently holding the post of secretary in the PCC. The intimation regarding the appointment of three leaders was given by Mrs Ambika Soni, General Secretary of the AICC and in charge of party affairs in the state, to the state PCC chief, Mr Kuldeep Kumar, today. The accident came to light late in the morning, when some villagers noticed luggage littered on the downside of the road and informed Ramshaihar police station of Solan district. Those killed included four women and one child, including Tejsingh, Mona, Dhanmaya Lamo Chhering, Chhuiki and a van cleaner belonging to the Tibetan colony in Sundernagar of Mandi district. The injured have been admitted to the Regional Hospital here and their condition is stated to be serious. The Maxi van was going to Sunder Nagar from Ambala cantonment. It probably fell down either due to a heavy fog which encircled the entire area at that hour or there was a breach in the road on this sharp turn due to heavy rain. It has also set up a three-member committee under the chairmanship of Mr Ashok Thakur, Principal Secretary, Forests, to review the instruction manual of the corporation and recommend suitable changes in it to prevent such irregularities in future. Action against these officers has been taken on the basis of the two separate inquiries ordered by the government to ascertain whether grading was being carried out correctly. The inquiry committees, during inspection of the sold and unsold stocks of timber in the five depots, found wide discrepancies in grading. They pointed out that strictly going by the manual, as much as 40 to 60 per cent of the timber classified as “C” grade should have been categorised as “B” grade. Grading plays an important role in determining the market price of timber. In case of superior species like deodar, grade “A” timber fetches up to Rs 33,000 per cubic metre, grade “B” Rs 26,000 and the grade “C” Rs 14,000. The difference in the prices of various grades is quite huge and any deliberate downgrading could have serious financial implications for the corporation. The corporation maintained that because of the ban on green felling, only fallen and dried trees were worked and as such the quality of timber was mostly poor. The percentage of grade “A” was less than 5 per cent and grade “B” 15 to 20 per cent; the rest was virtually of grade “C”, though strictly going by the manual, some of it could be classified as grade “B”. The officers have suggested review of manual to create another category in “B” grade for classification of poor quality timber. Besides, Mr P.K. Sinha, director of marketing, five other senior forest officers who were looking after the sale depots have been suspended. The officers are: Mr M.M. Khushdil, divisional manager, Baddi, Mr Swaran Singh, divisional manager, Nurpur, Mr Hari Shing Sharma, divisional manager, Mantruwala, Mr Suhil Aggrwal, divisional manager, Dhnotu, and Mr J.K. Dogra, subdivisional manager, Bhdroya. With Gujarat Ambuja Cement Limited (GACL) finally agreeing to hike the freight charges, the long drawn dispute for transportation appears to be resolved. The decision was arrived after a series of meetings of the district administration and the representatives of the three truck unions — Solan District Truck Operators (SDTO), Baghl Land Loser Society (BLLS), Ambuja Darlaghat Kashlog Mangu (ADKM). The vice-president of GACL, Mr Rakesh Sharma, while expressing satisfaction over the decision said the freight charges which were due to be hiked from April would now be hiked from February. As against the earlier freight rate of Rs 4.13 per km the revised rates of Rs 4.30 would now be applicable, he informed. He, however, expressed ignorance about the issue of distribution of work and said the new formula worked out by the district administration had not been conveyed to them as yet. The president of the SDTO, Mr Roshan Lal Jagota, however, expressed his displeasure over the formula being worked out. He said since the two other unions — ADKM and BLLS — were being given the lion’s share it was not acceptable to them. He rued that the SDTO, which had the highest number of 1313 trucks in comparison to ADKM’s 337 and BLLS’s 417, had been given a reduced share of transportation. He said the SDTO which was the oldest union and had not bought any new trucks after 1999 as per the company’s directions was being given a raw deal. He said its share had been reduced to 46 per cent while the other two unions had been permitted to ply 54 per cent trucks. This, he said, would not be taken lying down and a meeting would soon be convened to decide the future course of action. Transporters of SDTO also lamented that the other two unions had a lesser share of members in comparison to their union. Not only had the other two unions bought about 400 new trucks even after 1999 but they had also desisted from doing so to ensure even distribution of work. Mr Jagota said this distribution formula was not acceptable to their union and he would resign from the post of president if their share was not enhanced. The Deputy Commissioner, however, was not available for comment. However, confusion prevailed about the formula with sources revealing that the SDTO’s share in transportation had remained higher than the other two unions. It remains to be seen how the district administration manages to solve this issue of unequal share in transportation. The SP, Mr Gianeshwar Singh, said there was no law and order problem in the area and the situation was peaceful. This decision will harm the interests of the employees and the consumers, said Mr Dev Raj Sharma, state president of the sangh, here today. Talking to mediapersons, he said the employees would oppose this decision and launch an agitation. He said the board was already divided into four factions and there was no need to divide it further. He said the government was working under the dictate of world powers and thereby causing harm to the interests of the people. He said once the trifurcation was completed the electricity rates would be hiked. He appealed to the consumers to join hands with the employees and force the government not to take this “anti-people” decision. In a rejoinder, he said he was also present at the function of the state power engineers at Sundernagar and the Chief Minister, Mr Virbhadra Singh, while presiding over the conference had only emphasised upon the need to bring efficiency in the working of the board by making best use of the capability of the employees to harness the hydel potential expeditiously. He said the Chief Minister never blamed the employees and the board for failure in power generation. In fact, he called for promoting work culture not only in the board but also in other offices. Mr Kaul Singh said Mr Virbhadra Singh had always strived to strengthen the board and entrusted a number of projects to it so that its expertise could be fully utilised. He questioned the contribution of Mr Dhumal in strengthening the board and reminded him that the BJP government went on a spree to award hydel projects to the private sector with selfish interests. Projects were allotted even before obtaining environmental and other clearances required for the purpose. In fact the BJP regime worked as public relation agency for private companies ignoring the interests of the employees, he said. He said the present government had been given mandate by the people to bring efficiency and transparency which was at a discount under the BJP rule. He said now when the things were being set right in the larger interests of the state, the party was trying to give it a political colour to gain cheep popularity. A Rs 540 crore World Bank-aided social forestry project will be launched in Himachal Pradesh to spread green cover over midhill. This was stated by Mr Ram Lal Thakur, Forest Minister, while inaugurating a two-day workshop on the problem and prospective of afforestation and tree planting in degraded hills slopes here yesterday. The workshop was organised by the Regional Centre of National Afforestation and Eco Development Board of the Dr Y.S. Parmar University of Horticulture and Forestry in collaboration with the Forest Department. Mr Thakur said that two phases of Kandi project in the lower areas of the state would be completed and keeping in view the importance of this project, the government had to extend its duration by six months from April 2005. The Planning Commission had set the target of bringing 25 per cent of the state under forest cover by 2007 and 33 per cent by 2012. However, the state had already achieved the target of 2007 by covering 25.8 per cent, which was a great achievement. Dr S.S. Negi, Vice-Chancellor of the university, said the prime objective was sustainable development and conservation of biodiversity which could be achieved only by involving the people at the grassroots. He said for meeting the demand of fuel, fodder and small timber, all degraded areas and wastelands must be planted with multipurpose tree species. Bamboo plantation had a great scope in lantana-affected areas. Similarly Seabuck thorn, Willows and Poplars could be planted in cold desert areas whereas broad leaves farm species, which could be harvested without any legal implication, should be planted by the farmers in degraded land. As many 30 senior forest officers of Himachal, Punjab and Jammu & Kashmir are participating in the workshop. With little space for parking, traffic has become an unmanageable proposition. 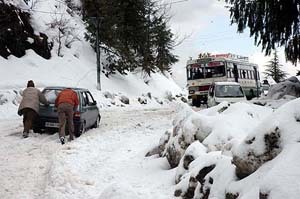 The problem is compounded with frequent traffic jams occurring in the surrounding town of Kalka. The DSP, Mr Surinder Verma, said the police personnel and the space available for parking had remained the same but vehicles had increased. He said policemen faced a major challenge in manning traffic effectively in the town. With a view to easing the problem, the kutcha portion of the road had been permitted to be used for parking by trucks on the national highway. The matter had been taken up a number of times with the municipal committee but nothing had come of it, he said. With no bus stand in the town, buses stop at every nook and corner to drop and pick up passengers. The presence of a school in the heart of the town puts a question mark on the safety of the children who have to cross the road. Residents said despite attracting investment worth crores, the government had not even constructed a bus stand. Hundreds of trucks can be seen parked all along the national highway. Though a few sites were identified by the local administration for parking, with little support from the municipal committee, nothing concrete could be worked out. Even the efforts of the administration to find a temporary solution in the form of providing parking space to trucks in the marketing committee’s complex yielded no result. The PWD’s national highway authority has now drawn up a plan to widen a 270-m stretch of the national highway between the PWD guest house and the housing board’s commercial complex. This Rs 257-lakh project, involving a portion of forest land, will be cleared by the Ministry of Environment and Forests, the Executive Engineer of the NH-PWD, Mr Ashok Gupta, said, adding that the formalities had been completed and tenders would soon be invited. The woman has been identified as Sudesh Kumari (70). Her husband Rup Lal is a retired headmaster of a school. The body was mutilated beyond recognition. However, no one involved in this crime has so far been arrested.